Comments: Ben Bacon (Nee: ) | Tuscola IL United States | 1961-1965 | Comments: Cecil Vernon Parker with Bacon inlaws. All left to right. Bottom row Marcus Bacon, Eleanor Bacon. 2nd row Orville Bacon, Annie Bacon, Charles Smith Bacon, Lucinda Bacon, Walt Huron, Minnie Bacon, Joanne (Bacon?) 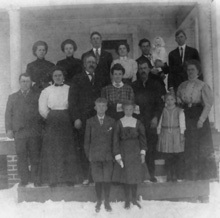 Top row Effie Bacon, Pearl Bacon, John Bacon, Maude Abigail Bacon Parker, Cecil Vernon Parker holding daughter Alice Neola Parker and Ben Bacon.